The 4 Level Semi Transparent Funnel Diagram for PowerPoint is a unique 3D design template. The vertical funnel diagram shows the wide segment on top, narrowing down to the bottom. 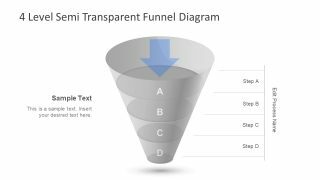 This is a 4 level PowerPoint diagram which can display the filtering and channeling of data. 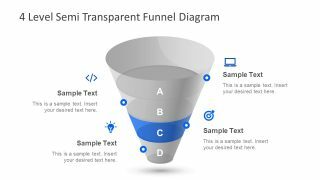 The funnels are basically a graphical illustration for conical objects. Hence, serves the similar purpose as the original tool. The professionals of almost every industry use this diagram time after time to display useful filtering of data. Thus, it is a multi-purpose presentation suitable to discuss the filtering-out process. And, it can present just about any topic, regardless of the industry. 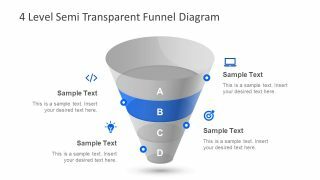 The 4 Level Semi Transparent Funnel Diagram for PowerPoint mostly benefits the sales and marketing professionals. 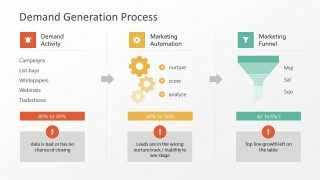 They can present the sales and lead generation process of the business. 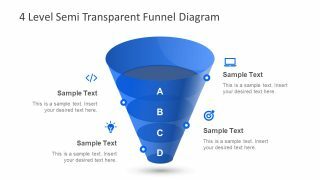 For example, the telemarketing company can use the semi-transparent funnel PowerPoint for educating new representatives. 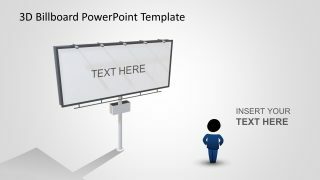 The 4 level PowerPoint has letters, clip arts, and text placeholders to represent them. 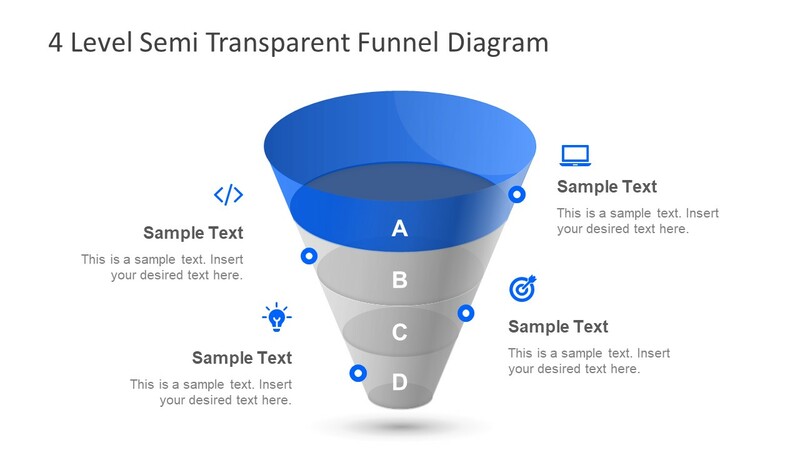 The unique PowerPoint funnel graphics and placeholders assist the audience to remember terms for a longer period of time. The template shows first four slides, highlighting individual level with blue shape fill. However, there are three more interesting layout designs. The last slide of PowerPoint funnel template displays icons at the first level portraying the raw data. 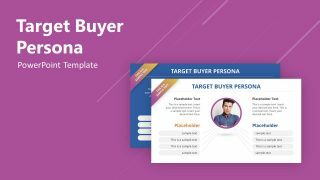 The sales funnel template is a quite common PowerPoint diagram in the corporate world. 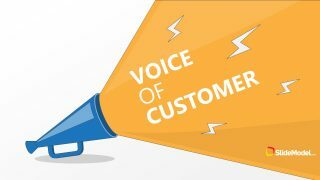 Therefore, the presenter needs to be creative in getting maximum audience engagement. 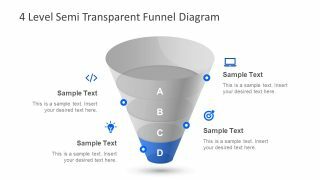 For this purpose, the SlideModel provides a variety of unique funnel diagram templates. The clip art icons in the editable PowerPoint are replaceable. The users can customize the template’s color, diagram size etc., along with these icons. Moreover, the text placeholders have a title and description sections to add relevant information. The audience can easily view the content when is it placed against each level.